If popularity made a fragrance iconic then Love Spell should be the staple of teenage girls. This is a familiar fragrance to me, partly because of its fruity floral composition but also because so many women and girls wear Love Spell, its perfume form, body mist, lotion and what have you. It is a simple fragrance, a little low on the complexity meter but what it lacks in complexity, it makes up for in wearability. In Bottle: Sweet, sweet, sweet. The first smell I get from Love Spell is a sparkling peach and jasmine fragrance. It’s like high school exploded in my nose and all I can smell is the trademark sugary peppiness that I was so familiar with. I remember when every other girl smelled like fruit or candy. I was the odd one out with nothing but a stick of deodorant between me and nothing. Now that I can experience all the fragrances I couldn’t wear when I was younger, I have to admit, I do see why this was popular. But its very essence, to me, screams of high school. Applied: Simple and inoffensive, that first whiff of bright fruits and florals is quick to start dissolving on the skin. It morphs away from brightness and into a near sparkly plastic-like fragrance for a few moments. I’m sitting there wondering if these flowers and this strange slippery plastic smell is going to stick around for a while. It kind of reminds me of a banana peel, slippery, fruity. I can almost taste that strange note which is funny. The banana fades the more I smell this as something aromatic that resembles culantro comes up and dominates the scene. Culantro, not to be confused with cilantro, is an herb. Unfortunately for the culantro and the florals, they evaporate very quickly and re-application is necessary. And with reapplication comes that sparkly banana again. I like the opener. I like the drydown. The culantro scent is an interesting touch that I don’t mind. I could probably do without that strange moment in the middle with the banana. Extra: Love Spell has that aura about it that screams of high school. There are fragrances out there that just seem to speak volumes about the culture that might surround them. Sweet, fruity, floral perfumes for example are usually in the category of young. Whereas deeper, denser more powder fragrances tend to be lumped in with the old. Me, personally, I don’t much care if I smell young or old. If you like a fragrance, just wear it. Design: Simple but not ugly. I’ve got no qualms with fragrances that stick to simple packaging. Especially ones that are more affordable like Love Spell is. The EDT will run you around $8-10 depending upon the sale going on at the moment. This fragrance comes in a purple box. Inside is a glass atomizer bottle with a cap over it. On the bottle is the name of the fragrance and a purple flower design. Notes: Apple, peach, cherry blossom, lilac, jasmine. I still remember the big fragrance going around the school locker room when I was younger. It was Hawaiian Ginger by Calgon. It seemed literally every girl was wearing this as everywhere I stepped in the school, in wafted Hawaiian Ginger. Turns out it was only a couple of people who wore this fragrance and evidently they were battling it out for Hawaiian Ginger supremacy because the fragrance permeated the entire school. 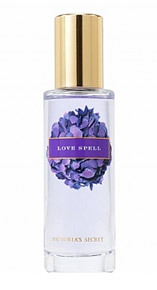 Reviewed in This Post: Love Spell, 2010, Eau de Toilette. This entry was posted in aromatic, floral, fruity, Reviews By House, victoria's secret and tagged floral, fragrance, fragrances, fruity, love, school, spell. Bookmark the permalink. ← Synthetic Fragrances, Are They Really Dangerous?